After a college football season full of many thrilling twists and turns, the bowl season is finally upon us. The 2013-14 college football bowl schedule begins on Saturday, December 21st, and concludes with the BCS National Championship Game on Monday, January 6th. For the full 2013-14 college football bowl schedule, please click the link below. There’s also a full college football bowl pick em sheet available. Both printable sheets are completely complimentary courtesy of PrintableBrackets.net. There are a total of 35 games on the 2013-14 college football bowl schedule, which opens up with four games on December 21st. The first game on the schedule features Colorado State clashing with Washington State in the New Mexico Bowl. Also on the 21st, Fresno State will face USC in the Las Vegas Bowl. On Christmas Eve, Boise State will square off with Oregon State in the Hawaii Bowl. Two games are on the 2013-14 college football schedule the day after Christmas, as Bowling Green will battle Pitt in the Little Caesars Pizza Bowl, and Northern Illinois will take on Utah State in the Poinsettia Bowl. On Saturday, December 28th, the Notre Dame Fighting Irish will travel to the Bronx to take on Rutgers in the Pinstripe Bowl at Yankee Stadium. 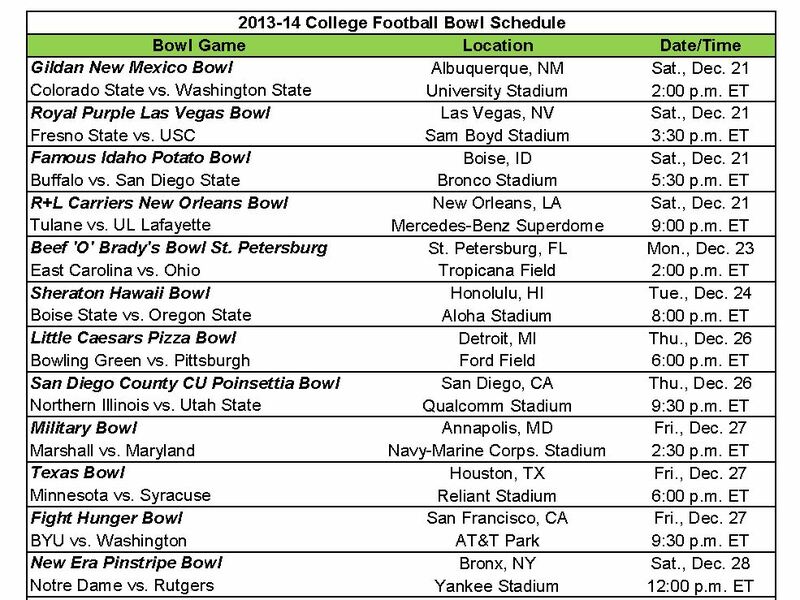 Four games are on the 2013-14 college football bowl schedule on New Year’s Eve. The schedule is highlighted by Texas A&M’s meeting with Duke in the Chick-fil-A Bowl in what is expected to be Johnny Manziel’s final college game. There are six games on the college football bowl schedule on New Year’s Day. In the first BCS game on the schedule, Big Ten champion Michigan State will square off with Stanford in the 100th Rose Bowl. Later in the day, Baylor will battle UCF in the Fiesta Bowl. On January 2nd, Alabama will meet Oklahoma in the Sugar Bowl, while Clemson will clash with Ohio State in the Orange Bowl on January 3rd. The 2013-14 college football bowl schedule wraps up with the last BCS National Championship Game to ever be played. On Monday, January 6th, undefeated and ACC champion Florida State will face SEC champion Auburn in the title game at the Rose Bowl in Pasadena.